There is nothing worse than spending your time and money on an eye-catching manicure only to find it chipped and battered a few days later. This problem is made even worse when you have gotten a design that you absolutely love — suddenly, a creative pattern has turned into a mess that you have to stare at every time you use your hands (which is a lot). To help you avoid this situation, read on for five proven tips to make your nail art last longer. One of the easiest ways to make your nail art last longer is to start with a comfortable nail length that isn't too long. The perfect length will differ from person to person, but the basic idea is that you don't want your nails to be getting in the way of your daily life. Mainly, if you are using your hands a lot during the day (for example, typing away on a computer), you want to keep your nails short. If your nails are too long, then it is going to be a lot easier for them to break or for your nail art to be chipped, which is not only annoying, but can also be painful and tedious. 2. Always opt for a base coat and a top coat. Regardless of whether you are getting your nails professionally done, or are taking a chance on doing them on your own, you always want to ensure that you are using a base coat. Prepping your nails with a base coat not only aids you in having healthy nails, but it also helps you grow your nails in a manner that keeps them strong. This strength is essential for getting the most wear out of your nail art because it helps reduce the likelihood that they will break. More than just that, a base coat protects your nails from stains and enables smoother polish application, which means that your nail art is less likely to chip. In a similar vein, using a sleek, shiny finish top-coat with a quick-dry formula is also important as it makes all the polish last longer. Just as with most things in life, not all nail polishes are made the same and not all nail artists have the same level of experience. If you want your nail art manicure to last as long as possible, it is crucial that you choose quality products and a highly trained nail technician. Whatever you do, don't purchase the cheapest nail polishes possible as they won't last as long as you want and they are more likely to stain and damage your nails. Yuck! Instead, opt to go with tried and tested branded nail polishes that have a reputation for long-lasting wear. "Negative space" nail art is a contemporary manicure style that fuses designs on a transparent background. Generally, this style features clean lines and graphic shapes and looks minimal and fun at the same time. If you go for a neutral color scheme, you can ensure that your nail art will match any outfit you put together. However, it is still possible for color-lovers to embrace this trend. Simply ask for sleek lines in colorful stripes down the middle of your nails for a classy yet vibrant style. By opting for a super-simple design that packs maximum impact, you are getting nail art that is both practical and stylish. Why is it practical? Well, your manicure is guaranteed to last longer as it won't look as grown-out as quickly as it would, should you opt for a solid color. No matter what style of nail art you decide on, or where you get your manicure done, you want to be allowing your nail polish adequate time to dry. By giving the polish time to dry in between coats, you are taking a massive step to reduce the chances that any of the color or art is going to budge or smudge. After every coat, let the polish dry thoroughly prior to painting another layer. For those times when you are in a bit of a rush (it happens to everyone! ), wait one minute after applying nail polish and then dip your hands in ice water to quicken the drying process. 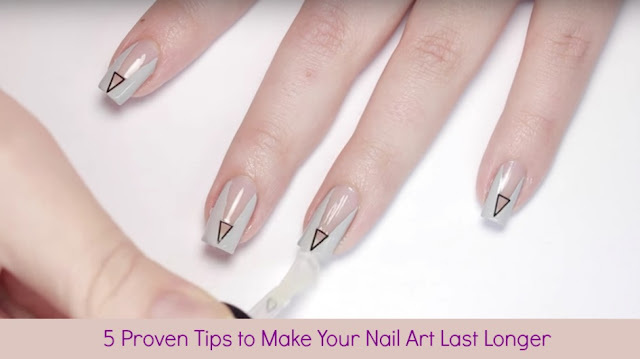 If you follow the tips above, then long-lasting nail art, here you come! Do you regularly get nail art? Why or why not? Do you have any tips and tricks for making your nail art last longer? Please share with us your experiences and suggestions in the comments below! Author bio: Hillary Kozma who is the Owner/Creative Director/Managing Director of Kozma & Kozma Salon. Having built the foundation of her skills with an apprenticeship under a direct protege of Vidal Sassoon, Hillary & her husband opened Glow American Salon in Qatar in 2007 before expanding to Dubai as Kozma & Kozma in 2016. She is hailed by the media as a “pioneer in her field” for introducing new talents, philosophies, and techniques to the Middle East.